PACER offers bilingual workshops, individual assistance and translated publications focusing on issues facing families from diverse backgrounds. The following publications have been translated into Hmong. A 37 minute audio/video (translated in Spanish) overview of special education created to help parents of children with disabilities understand what special education is, how a child might get into special education, how to resolve disagreements, and what role parents play. 2009. Laminated cards with questions to ask during your child's Individualized Education Program (IEP) meeting, as well as questions to ask about the IEP process. 2014. Laminated 3 x 5-inch cards detailing parent rights and responsibilities in special education as well as topics of discussion for IEP development that parents can bring with them to their child's IEP meetings. 2010. 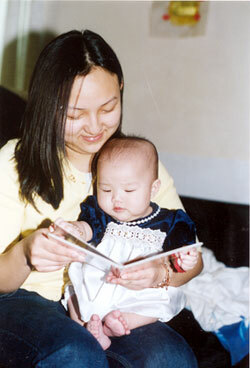 This series of five booklets teach and encourage parents of young children (birth to age 5.) All are simply worded and beautifully illustrated with photos of children and families of various ethnic/cultural groups. See complete description under Early Childhood. 2000. Let’s Talk is an easy and fun way for parents to interact and help your child be ready for reading. These cards will help build your child’s vocabulary and speaking skills—the first steps in learning to read. No special supplies are needed, just you and your child. Let’s Talk and Count! is an easy and fun way for parents to interact and help your child be ready for reading and counting. These cards will help build your child’s vocabulary and speaking skills, as well as increase your child’s early math skills. No special supplies are needed, just you and your child. Summarizes PACER’s projects, workshops, and resources. 2010. Intended for professionals. Features Southeast Asian parents who have children with disabilities speaking about their experiences with special education and other services. Explores family traditions and attitudes toward education, authority, and disabilities. Discusses specific cultural issues. 17 minutes. 1996. Closed-captioned. Parents can keep important papers related to their child's education plus helpful tips on working with your child's school. 2004.